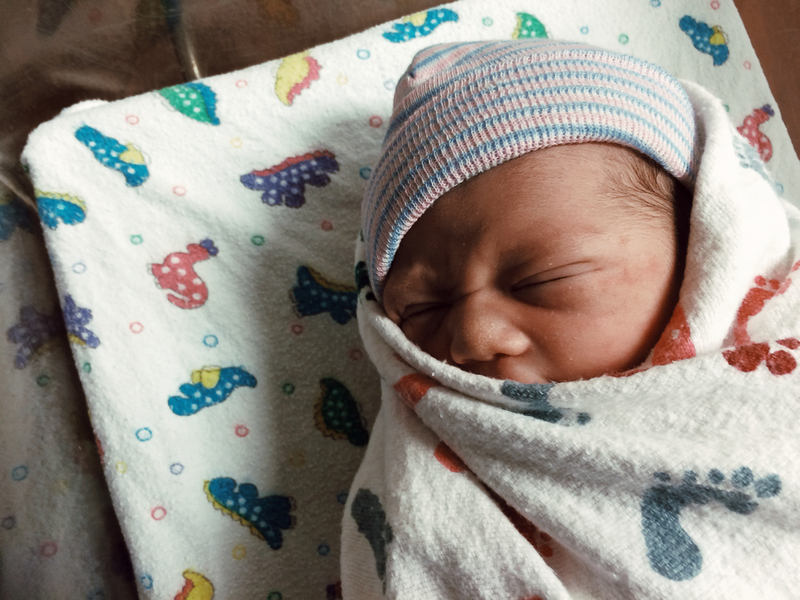 On November 18, 2014, Jose and I welcomed Jackson Bedingfield Serrentino into the world. He was born at 8:05am and weighed 7 pounds, 2 ounces – he appeared to be a very happy and healthy little boy! Jackson stole our hearts the minute we laid eyes on him. 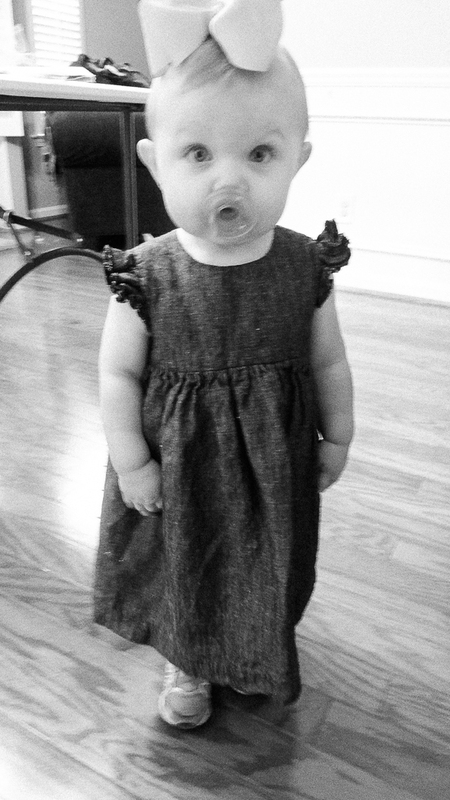 We are so grateful to be blessed with this beautiful child. Last Wednesday evening, Jackson was sent to the Odessa NICU because he was not able to breathe regularly on his own. By Thursday evening, the doctors discovered that Jackson has a serious heart condition, and we were immediately airlifted to the Methodist Hospital in San Antonio to prepare for surgery. This morning, Jackson will undergo heart surgery to correct a coarctation of the aorta. This is a condition in which the aorta vessel leading up to his lungs has been pinched, blocking a steady flow of blood to his lungs. I have started a blog this weekend to explain the diagnosis, and also to share news about the surgery and his recovery (ourbabyjacksonbedingfield.wordpress.com). I’ll also be posting updates on this blog as the week progresses. Please keep our family and especially this sweet baby boy in your prayers this week! (March) Jose and I had just returned to Midland from our trip to Denton, where I took my accounting final at UNT. It was a tough class and I was just exhausted by the end of it, but I wondered why it was taking me so long to catch up on my sleep from the trip! I soon found out it was because I was expecting a baby!!! This child was something we had been hoping for and been looking forward to for a long time, but nothing prepares you for the moment you find out you’re actually going to be a parent. We were beyong estatic, and wondered how we were going to keep the news to ourselves for so long. (April) Jose and I stayed busy by keeping up with our running schedule together. We had been training all spring to run our first 5k together on April 11th. I’m so glad we kept up with this exercise routine – it kept me from thinking too much about all the changes and uncomfort I was starting to go through at this time! Our 10 week appointment with the OB doctor was on April 29th, when we saw our precious baby via ultrasound for the first time. It was the most magical moment for us both, we were just in awe watching him wiggle and dance on the screen. 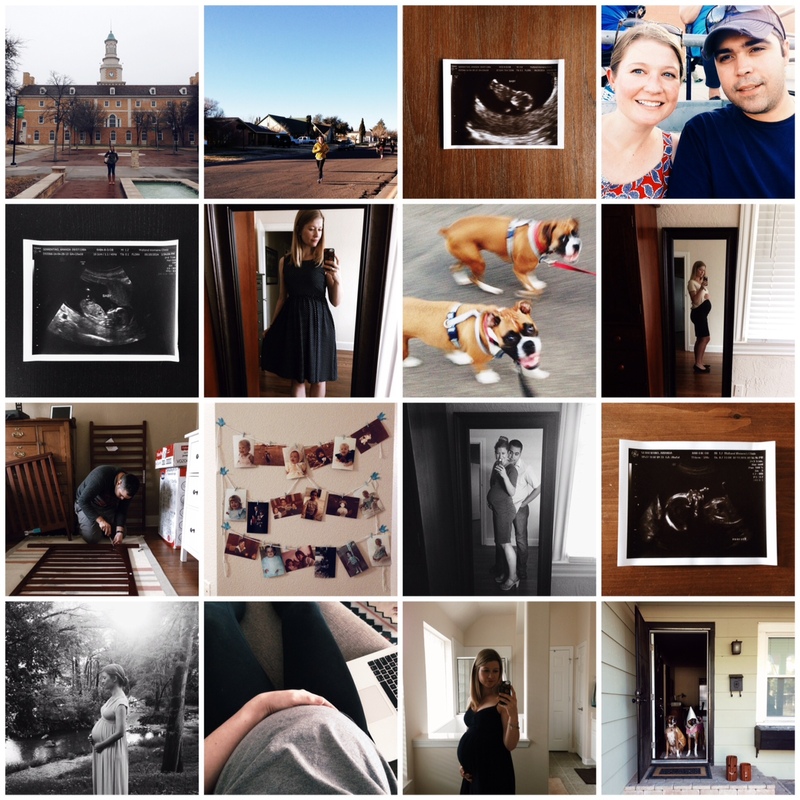 I still hadn’t experienced any morning sickness at this point, but was grateful that my spring semester was a condensed one. I don’t know how I would have kept up with both work and school while still feeling so sleepy all the time! (May) We FINALLY broke the good news to our families! Jose was able to tell his family in person, and I was on the phone with him via FaceTime when he did so. I will never forget the look on his sisters’ faces when we told them the news!! At the end of the month, we took a short but sweet trip to Atlanta for my cousins graduation celebration. I knew it’d be the only time I would spend with my family before the baby was born, so we jumped at the chance to be with everyone together all at once. (June) School started back for me, and I was a little nervous about how I would balance work and school while also being pregnant. Luckily for me, I got my energy back at this point, and my class was a nice distraction from the anticipation we had of finding out whether the baby was going to be a boy or girl (we wouldn’t find out until July!). Jose and I kept up our running, and were training for our next 5k race on July 4th. While the weather was starting to get hot, it was still not as bad as some past summers we’ve spent here in Texas. I was especially grateful for the milder temperatures this year!! (July) The weather eventually started to warm up to normal temperatures at the beginning of this month – July 4th weekend was a hot one! We ran our 5k early on that July 4th morning, but at a pretty relaxed pace. I knew at that point my growing belly was starting to slow me down. The next Friday, we had our appointment to find out if it was a boy or girl. For some reason, both Jose and I were convinced that it was going to be a little girl, so when we found out it was a boy, we were both just beside ourselves from the surprise! We came home that day and immediately started thinking up names (we had had a girl’s name picked out and ready, but still hadn’t quite settled on a boy’s name at that point). (August) My least favorite month of the year in Texas, only because of the excruciating heat. I survived, but had already switched from running to walking very early in the mornings with the dogs. I was hoping to keep up with running throughout my pregnancy, but the heat was too much to bear and I didn’t want to make myself sick by pushing through with exercise. I was a little disappointed, but began enjoying my long daily walks with the puppies. (October) My last month at work ended up being one of the busiest! I was working on a special project for the office, while also training the person who’d be taking over once I was gone. On top of that, Jose and I still hadn’t finished the nursery at home, and we kept busy at home putting together all the baby gear we had gotten as gifts the month before. Also, by this time, I started feeling very pregnant, and just the normal everyday routine was starting to wear me out. I was counting down the days until I was done with work! My last official day was Halloween (October 31st) – and saying goodbye to everyone was a little bittersweet. I had come to really like working with several of the ladies in my office, and would miss the day-to-day routine of getting up and going to the office each day. I also knew that the change meant this baby was on his way SOON! 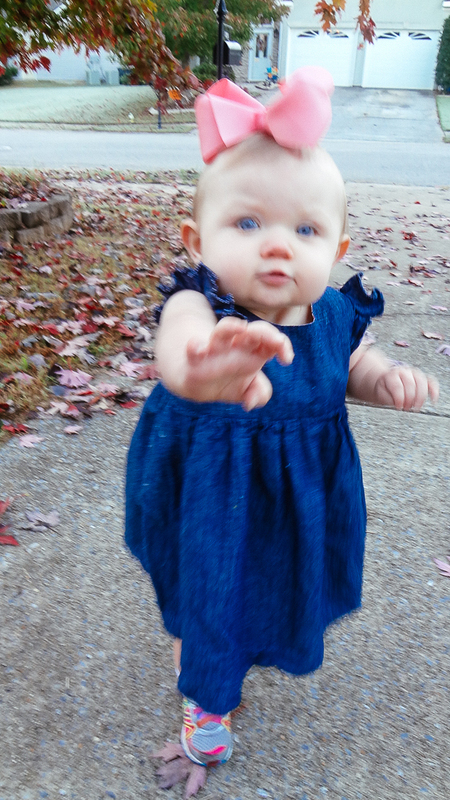 (November) These past two weeks, I’ve had a long laundry list of things I wanted to do at home before the baby arrives. Turns out, being nine months pregnant, it was a bit silly to think I’d be a productivity machine at home (this nesting instinct is serious business!!). We are having lots of company come to visit these next two months, and I wanted the house to be ready for all our guests. But with the baby arriving in just a couple of days, I’ve come to accept that what’s done is done, and anything left will just have to wait until after the New Year. Also, I haven’t been sleeping too well at all this past week, and have had sort of a loss in appetite these past days, but each night I go to bed I just think about how we’re one day closer to meeting this sweet baby, and that the pregnancy stage is finally coming to an end!! I’m sure I’ll be posting lots of photos on my Instagram account, if you want to follow along there. I’d also like to share more about the baby and motherhood here on the blog, if for no other reason than to keep me accountable for documenting this little one as he grows up (from what I hear, it all happens in the blink of an eye!). 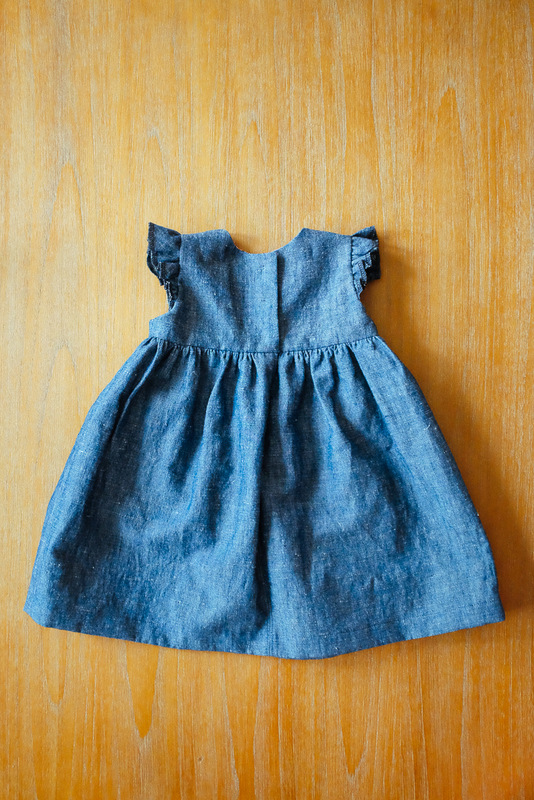 A Denim Dress for the Birthday Girl! Just a couple more weeks left to go before Baby Serrentino makes his appearance!! Jose and I have been making the finishing touches on the nursery, washing baby clothes, and putting together all the baby gear. It’s all becoming more and more real!! Tomorrow will be the last day at my office job before my “new” job starts – mommy hood. :) I’ll still be working on my masters part-time, but other than that my new job description will read “stay at home mom”. I’m equally nervous and excited for the transition. It’s hard to know what to expect at this point, but I feel like we are ready, nonetheless. I’ve been working on sewing up several things for the nursery, but I’m not quite done with everything just yet (hopefully the baby doesn’t inherit my tendency to procrastinate!). Everything’s coming together, though, and if he can hold off arriving until his due date then I’m sure I’ll have things finished up and ready to show off here on the blog when I’m done. 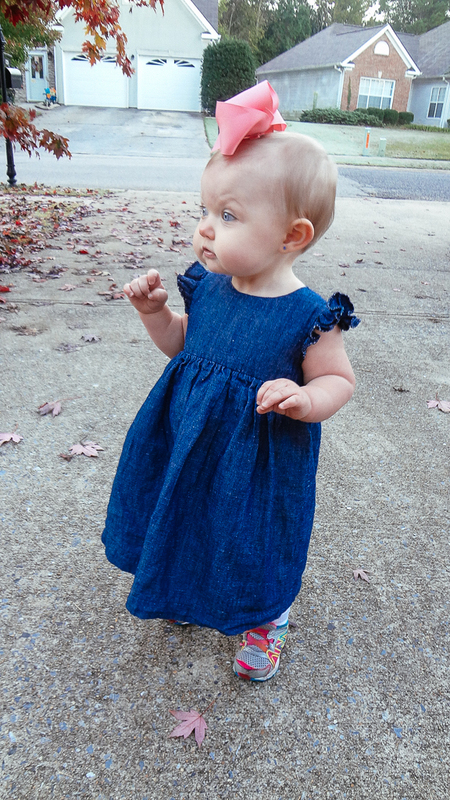 Anyway, last month my baby niece Kelsey turned one year old, and I decided at the last minute to make her a birthday dress for the occasion. 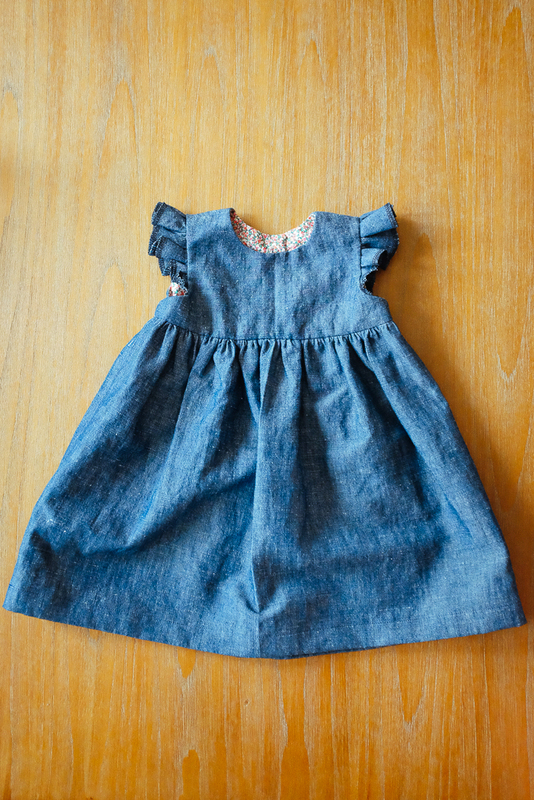 :) I first came across Made by Rae patterns when I found out I was expecting, and I just fell in love with her designs! 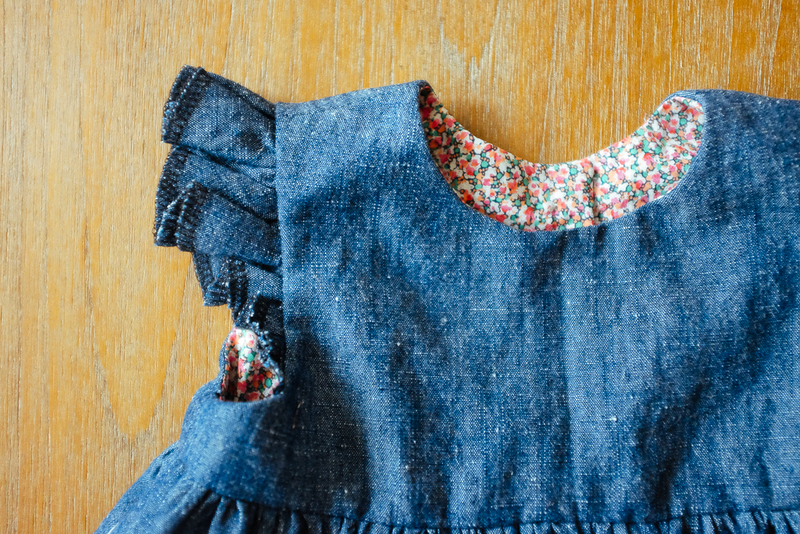 I really like how many of the patterns come with multiple variations – it’s easy to tweak her pieces to work for a variety of age groups and seasons throughout the year, depending on which fabric you use. Time Spent: From cutting out the pattern to hand-sewing the snaps, I’d say about half a day, plus an extra evening finishing up the hem and snaps. 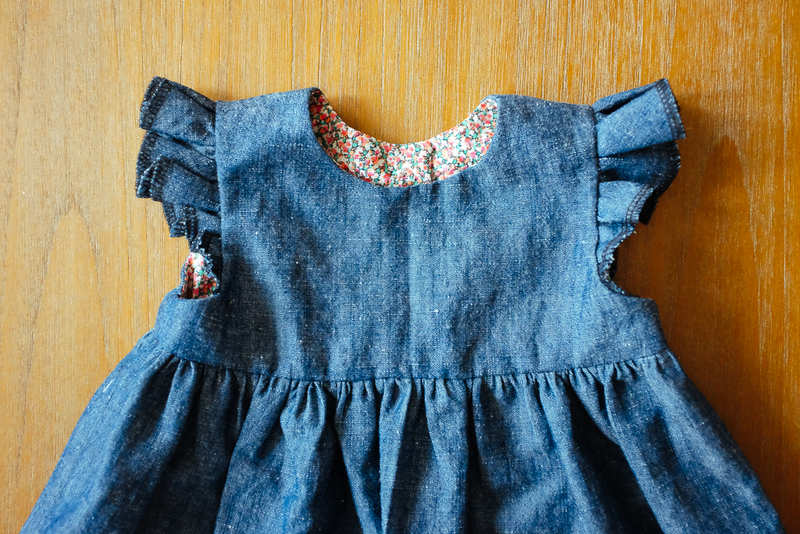 This was my first time making any type of kid’s clothing, and – like other sewing bloggers out there have mentioned – I was surprised at how quick and easy the whole thing came together! 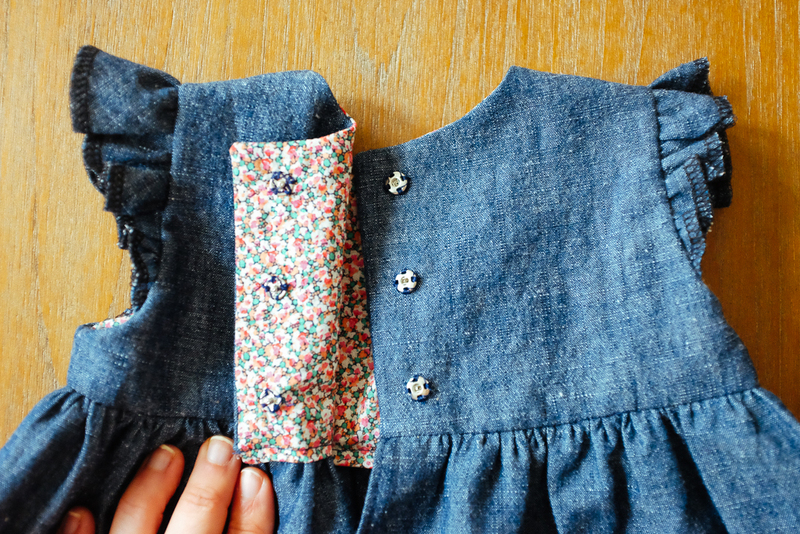 The pattern calls for either button or snap closures in the back, and I originally wanted to use buttons before I realized I didn’t have the right foot for my sewing machine. So I went with snaps, instead, which were fine – although I think the dress would have been much cuter with little buttons on there. Oh well, it ended up working out, and now I know that I need to buy that particular sewing foot before I try anything else with buttons.